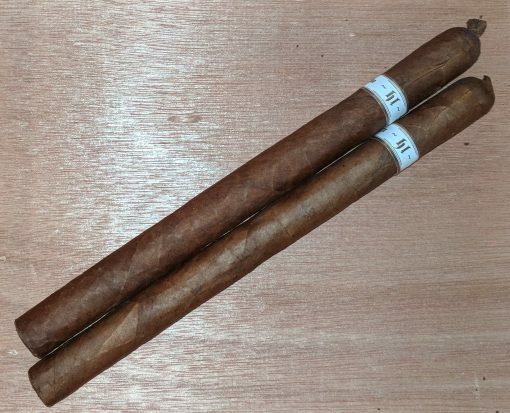 We’ve reviewed a handful of the original line of Illusione cigars, now known as the Original Documents, but never the lancero-sized Holy Lance (hl). While the Original Documents natural-wrapped Illusione line has come to designate the debut of Illusione, hl, plus the corona-sized mk, were added to the line in 2008. The Holy Lance. My Lancero, the lance. Get it? Constantine was the first Christian emperor to lead Rome. It was fabled that he had possession of the very spear that punctured the side of Jesus while on the cross. He was said to carry this relic into battle and, it was said that it helped him win his many battles. It is an artisan blend and the mildest of all my cigars. The cigar uses a blend of Nicaraguan Criollo ’98 and Corojo ’99 tobaccos finished with a triple-A grade Corojo Rosado wrapper. Whether intentional or not, the wrappers of the cigars I smoked were more reddish than other vitolas from the Illusione line. Each of the three samples I smoked were aged over three years. The cigars produced an abundance of medium-bodied flavors with toast, cedar, oak, leather, and almond milk. There are hints of white and green pepper spice, especially on the finish. All in all, it’s a balanced symphony of complex, authentically Nicaraguan flavors, which is perhaps not surprising considering Giolito says his inspiration for the blend is the Joya de Nicaragua cigars of the pre-Sandanista era. Construction on my Holy Lance was flawless, with excellent combustion and a firm, yet not overly tight, draw, which sometimes can be a challenge to create in the slender lancero format. The even ash held for a full inch at a time. I consider this to be one of the finest lanceros in production today, and these aged cigars showed that they lose nothing after a few years, and might have gained some added complexity. Though not the first Illusione cigar to earn our highest rating, the Holy Lance is the first from Illusione’s original blend to earn five stogies out of five.